World Affairs Council hosts pro-TPP gathering. 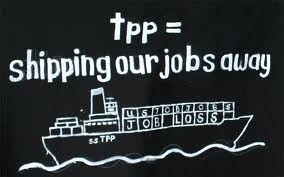 We will be outside with our No to the TPP message. Plan on joining Oregon Fair Trade Campaign, Alliance for Democracy and others for this protest of the Trans-Pacific Partnership - bad for labor, bad for the environment, bad for access to medicine. Only thing the TPP does is is enrich the 1% and hurt everyday people around the world. Join Oregon Fair Trade Campaign and our allies to send a LOUD and clear message to the White House, the State Department, and our Oregon Congressional Delegation: DOWN with the Trans-Pacific Partnership! There will be speakers on the human trafficking, forced migration, human rights, the offshoring of American jobs, and how all of these challenges will be harder to fix, not easier, if the TPP is ratified. The Trans-Pacific Partnership (TPP) is one of the most ambitious free trade agreements ever signed. Those in favour say this trade deal will unleash new economic growth among countries involved. Those against - particularly some Americans - fear it could mean jobs will move from the US to developing countries. They also do not like the fact the five-year talks were held largely in secret. Most goods and services are involved, but not all tariffs - which are taxes on imports - are going to be removed and some will take longer than others. In all, some 18,000 tariffs are affected. On textiles and clothing, they will be removing all tariffs, but while the US Trade Representative says most tariffs will be removed immediately after the deal is ratified, "tariffs on some sensitive products will be eliminated over longer timeframes as agreed by the TPP Parties". The full text of the TPP agreement - which runs to 30 chapters - has now been published and you can read it all here. You can find more on the specific industries involved here. 9. SECRET DEAL: Obama has angrily dismissed the notion that TPP is a “secret” deal, saying that everyone will have public access to the TPP text for at least 60 days before a final vote. This is not the point opponents are making. The vote on fast track would severely limit Congressional input into the deal. And right now, members of Congress can only see the text in a secure room, without being able to bring staffers or take notes, or even talk about specifics in public. That makes the deal effectively secret during the fast track vote. “The president has only committed to letting the public see this deal after Congress votes to authorize fast track,” Warren told Greg Sargent. The President wants to filibuster-proof the bill in secret, then employ pretend transparency on TPP after that. January 2014 marked the twenty-year anniversary of the North American Free Trade Agreement (NAFT A), a pact that has had devastating consequences for people and the environment in all three countries and beyond. (1) Intellectual Property Chapter: Leaked draft texts of the agreement show that the IP chapter would have extensive negative ramifications for users’ freedom of speech, right to privacy and due process, and hinder peoples’ abilities to innovate. Our actions will be on Tuesday and Fridays from 11 AM to 1 PM. What to bring: We will have the banner (as above) plus a few signs. Plus whatever signs you bring. No pay cuts. No TPP. No Fast Track. Call Senator Wyden. No Fast Track. No TPP. Be creative! Please join us. Each week I will send an email reminder out with locations. To join the list, please send an email to davidafd@ymail.com. Join us to learn how you can take action to Stop the TPP and Get GMO Labeling in Oregon! The Trans-Pacific Partnership (TPP) has been called "SOPA on steroids" -- and for good reason. Negotiated behind closed doors by the governments of a dozen countries (including ours) colluding with corporate interests, this secret "trade" deal (much of which has little to do with actual trade) would grant unprecedented snooping and censorship powers to ISPs, copyright holders, and governments. Tell Congress: Say NO to fast-track trade authority. Click here to automatically sign the petition. And that's only one chapter, when there are many other chapters that haven't been leaked. It's the job of Congress to fully vet trade deals and ensure they work for everyone, not just giant corporations. In fact the Constitution gives Congress exclusive authority over trade. And it would be a deeply irresponsible abdication of responsibility for Congress to pass fast track when we know the TPP is coming down the pike, especially when we know the consequences of the TPP could be disastrous. That is why hundreds of groups including the Electronic Frontier Foundation, Demand Progress, National Nurses United, the Sierra Club, Democracy for America, and Public Citizen have spoken out against fast track. Under the TPP, Internet freedom would be a joke. But it would cause all sorts of other problems. Developing countries would lose access to lifesaving medicines. Unsafe foods and products could pour into our country while we're powerless to stop them. Gone would be the days when the United States could regulate coal exports. And the excesses of our crazy intellectual property laws that privilege corporate control over innovation would be both exacerbated and extended internationally. You might think such a far-reaching proposal would be subject to intense public debate. But the text of the proposed deal is considered classified by our government and even members of Congress have been given extremely limited access to it. We know the little we do know about the deal because drafts of some of its chapters have been leaked. Pressured by giant corporate interests that stand to make huge amounts of money on the deal, and faced with a public that has purposefully been kept ignorant about this deal, it’s not hard to see how the TPP could be rammed through Congress if fast-track trade authority were in place. In fact, the reason the corporate lobby is pushing fast track is that they know the TPP could not get through Congress without this extraordinary power grab. So the first thing we need to do to fight back is to ensure Congress does not tie its own hands by passing fast-track trade authority. 1"TPP Leak Confirms the Worst: US Negotiators Still Trying to Trade Away Internet Freedoms," Electronic Frontier Foundation, Nov. 13, 2013. 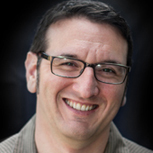 2"Five key questions – and answers – about the leaked TPP text," the Washington Post's Monkey Cage blog, Nov. 15, 2013. Activists dropped banners and marched in a “Fast Track” train to draw attention to the Trans-Pacific Partnership agreement that corporations are trying to quickly make law. Imagine a law that would allow corporations to sue countries whose labor laws, environmental legislation or food safety regulations result in a loss of profit. Well, it has a name: the Trans-Pacific Partnership. This agreement would further undermine the last traces of our democracy by allowing corporate power to permeate through various areas of our society. And it’s all being negotiated in secret. About 600 representatives of corporate-interest groups, including Walmart, Monsanto, Chevron and Halliburton, have been advising the White House on the new agreement. Meanwhile, Congress has been completely left out of the matter, and now corporations want to “fast track” the legislation in order to quickly make their dreams come true. This process, known as Trade Promotion Authority, allows the president to sign legislation into law without congressional approval. Congress will then only get to weigh in with an up or down vote on the matter, without expert testimonies, hearings or opportunities to make amendments. This could all happen within the next few months. On Monday, protesters continued their actions by marching nearly three miles in a “fast track” train. Beginning at the White House, the activists once again paid a visit to the Office of the U.S. Trade Representative before making a stop at the U.S. Chamber of Commerce. The protest concluded in front of the Capitol. The protesters have plans to escalate their tactics if a lack of transparency and congressional oversight continues. Congressmembers from both parties, including Elizabeth Warren, Alan Grayson, Michelle Bachman and Walter Jones, have also vocally opposed the fast track process and are demanding that TPP’s text be released. According to Flush The TPP, citizen opposition has stopped 14 trade agreements from becoming law in the last ten years. This means the people can do it again. 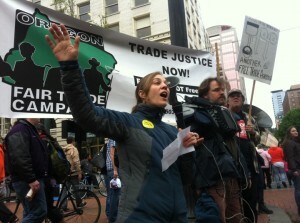 To learn more about TPP and how to get involved in the movement, visitflushthetpp.org. 1. Educate and unify people by showing that the issues we care about will be made worse by the TPP. The TPP is not really a trade agreement at all. It is a corporate end run around government on everything from Internet freedom to banking regulation; from worker rights to health care; from environmental protection and agriculture to consumer safety. The TPP is an issue that unites us in solidarity across issues and across nations. 2. Expose the corporate interests who have drafted the agreement. Three years of negotiations have been kept secret from the media, elected officials and the public while business interests like Monsanto, WalMart, Wall Street banks, massive pharmaceutical companies, Exxon-Mobil, BP - in all there are 600 corporate advisers - are helping to draft the TPP. The result is an agreement that puts profits ahead of the necessities of the people and the protection of the planet. 3. Stop “Fast Track,” now known as Trade Promotion Authority. The Obama administration knows it cannot pass the TPP if Congress plays its constitutional role by holding hearings, allowing witnesses to testify about the impact of the TPP and allowing amendments. 4. Stop the TPP with protests at negotiations, corporate headquarters, in Washington, DC and at home in congressional districts. 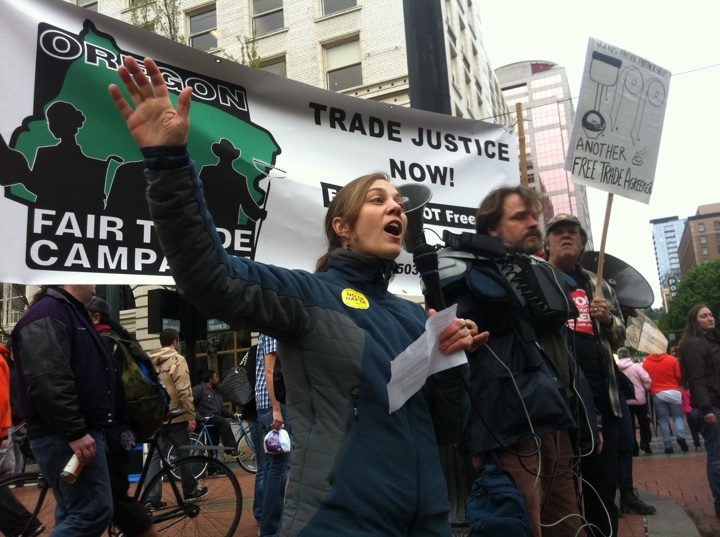 Since the Battle of Seattle in 1999, the World Trade Organization has been stalled. When the people know what is in the TPP, they will stop this too and any member of Congress supporting it will be kicked out of office. The Trans-Pacific Partnership can be stopped. Already, a movement is growing to stop it and we will work closely with that movement. We need you to help: start by spreading the word. Worker Rights: Today, Seattle became the seventh US city in which low-paid workers walked out of fast food restaurants demanding a living wage of $15 per hour.Thousands of women in Cambodia who work in garment factories held a sit-down strike despite being confronted by police wielding electric stun batons akin to cattle prods. WalMart workers launched their first sustained strike and will hold a June 7 Ride for Respect to the annual shareholders meeting. United Students Against Sweatshops continues to protest sweat shops, unfair wages and industrial accidents. Under the TPP, laws protecting workers would be challenged with corporate lawsuits for any decrease in profits. 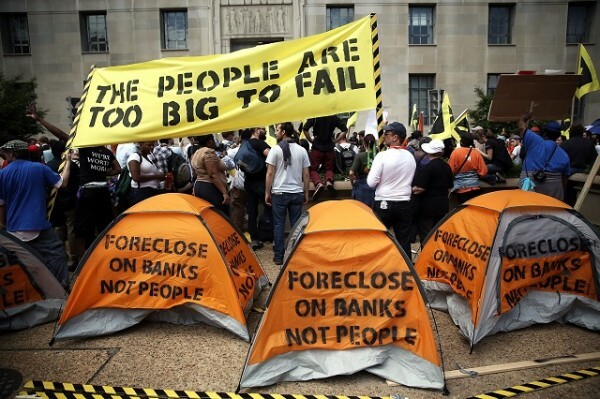 Housing: Foreclosure activists conducted mass protests last week in Washington, DC. The actions they seek and laws like the Homeowners Bill of Rights in Minnesota, which passed because of activist pressure, would be challenged under the TPP. Banks and mortgage lenders could sue governments in trade tribunals for lost profits, in which the judges will often be corporate lawyers on leave from their job. Education: Students who are protesting the closing and the privatization of schools will find that there is strong opposition in the TPP to so-called “state-owned enterprises” such as public schools which will also weaken public services like health care in favor of for-profit corporate interests. The Environment: Environmental groups organizing for the fearless summer of protests against extreme excavation of radical energy will find their goals more difficult to achieve despite “terracide” and tar sands waste that is piling up. Existing trade laws have resulted in 450 suits by corporations against 89 governments. Over $700 million has been paid to corporations, about 70 percent of which are from challenges to natural resource and environmental policies. If a country decides to ban fracking or tar sands, the companies will sue for lost profits. Big Finance: Protesters who want to see the big banks broken up, top officials prosecuted or greater regulation will find the TPP makes these more unlikely. The TPP gives banks greater laxity to move money in and out of countries, stops regulation of banks and allows casino-style high risk investments to continue. Food: Opposition to Monsanto and genetically engineered foods will be made more difficult. As Trade Justice for the New York Metro area points out: “Under the TPP, the sovereign right to control biotech foods will be delegated to BigAg – a world market concentrated in the hands of a few multinational players that will entirely circumvent the democratic process and political action." 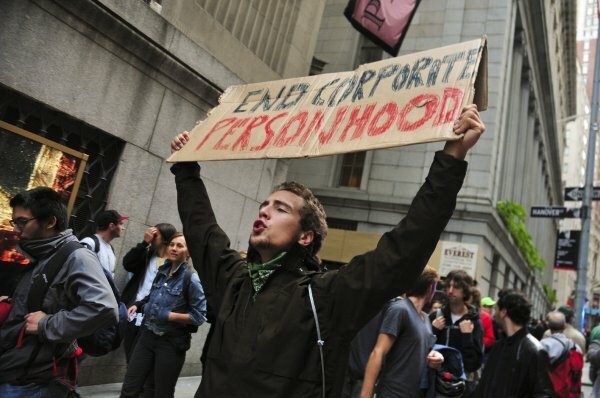 Corporatism: Last week, Los Angeles voted 76.6 percent to end corporate personhood, joining 175 other cities in calling for a constitutional amendment to end the rule of money. If the TPP isn’t stopped, we will look back on it as the move to corporate nationhood. These are just a few examples of current injustices people are working to end that will be made more difficult if there is a global corporate coup. We will send you more on the Stop the TPP campaign in the coming weeks. For now, begin to educate the people you know by sharing this newsletter (see below) and urging them to sign up. All of the ingredients for a mass popular resistance movement exist. People are suffering under an economy that favors wealth and a dysfunctional government corrupted by campaign money, and people see there is a path that could lead to successful transformation of the government and economy. Now is the time to get involved and help make the potential a reality. Pictures of the summit in Blaine! It started with a rally at 1pm and ended with a meal and an organizing summit at 2. The Blaine summit and rally’s organizing partners include the AFL-CIO, Citizens Trade Campaign, Council of Canadians, Sierra Club and over a dozen other local social justice organizations. It’s timed with a similar event along the U.S./Mexico border, and will be kicking off an exciting new tri-national campaign on the TPP just prior to Mexico and Canada’s first round of TPP negotiations, which take place from December 3 – 12 in Auckland, New Zealand. To learn more, please contact us at (503) 736-9777 or elizabeth@oregonfairtrade.org.